I do love a good Pizza, but haven’t eaten flour for a long time. I have had a few tasty ‘gluten free’ versions, but I don’t always feel great about all the fillers that are in gluten free anything, and I really prefer not eating any type of flour at all. 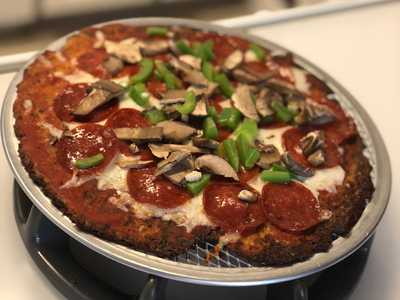 In attempting Cauliflower crusts, I have found them difficult and time consuming to make in addition to just tasting like cauliflower rather than pizza. 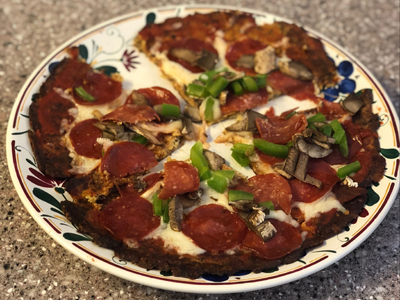 The recipes I have seen with almond and other flours turn out not to be very low carb at all if you eat more than 1 piece, and who eats only one piece of pizza? ugh! I don’t love it when recipes say they are low carb and calorie, but that is only because you can have one teeny piece. I am delighted to have discovered Cauli’flour Pizza Crusts! OMG! The pizzas are hand crafted with only 4 ingredients: Cauliflower, Mozzarella Cheese, Milk, and Eggs. The spices are basil and garlic; The spices are perfect, they really taste like an Italian Pizza, not cauliflower. The crusts freeze really well too. 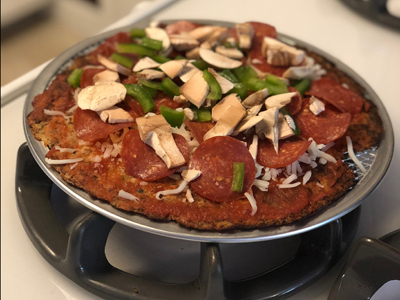 With this, the entire Pizza is only 3 net carbs and 180 calories; the main ingredient you have to watch out for on the carb count is the tomato sauce that you add. Makes me so happy to know I can have the whole pizza for a meal if I want to. It is, however, very filling so often 1/2 to 3/4 is more than enough. I have included my favorite recipe here. Let me know if you try it and what you think. PS No, i do NOT work for the company in any way. I just get really excited to find great products with real food in them and I am excited to pass the information on others. *note even though the above portions of each item seem small, it was plenty, especially for one person. Bake for 12-16 minutes total/until done. Take the pizza out of the oven and let it cool completely. It is important to let it cool completely so it gets crisp. Spread the tomato sauce evenly on Pizza. If you don’t want crispy edges, spread the sauce to the edges. Spread the rest of the ingredients evenly and layer them as you please. I prefer cheese, pepperoni, mushrooms, and green peppers in that order. Bake the whole thing for another 5-10 minutes. You can broil it for another 3-5 minutes at the end if you like it crispy. Let it cool for added crispness.